I’m like that with old technology as well. Some people have the weirdest taste in music. To our main characters and Zed has tracked down John and Chas – John tried to leave her behind but her being psychic makes that kind of hard to do. 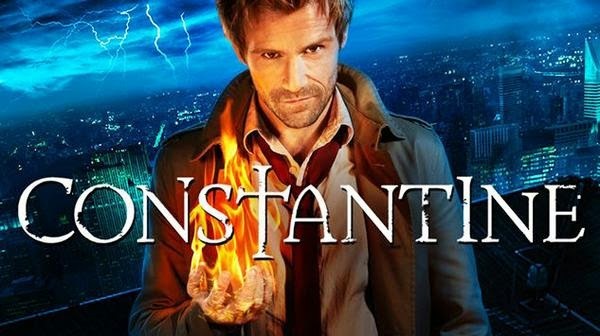 John, meanwhile, is covered in blood and babbling nonsense (in a rather ridiculous fashion – c’mon Constantine I want magic and creepy, not weird and embarrassing). Apparently this is learning a spell. The Mill they’re in is a supernatural safe house and a Tardis, albeit not nearly so cool. Out comes the map and John explains all the ominous blood spots to Zed and he has a newspaper article about Bernie’s death – Bernie’s an old friend of John’s. Zed uses her vision-ness to pick up Jasmine and cold (and John snarks about being touch psychic and downside in bed). He tries to leave but she insists on coming with despite his attempts to “protect” her. Since he doesn’t have a car, he agrees. When she leaves, John confesses to Chas that he’s suspicious of Zed – but will keep her close to be sure. In Chicago they have to get in the morgue and after John’s bag-of-ticks don’t include magical lock picks, Zed helpfully steals a keycard. They find Bernie’s body, John drops his backstory with Bernie (and a punk band) before pulling out his hand of glory (nasty thing) to speak to the dead (not traditionally what a hand of glory did – but who am I to argue about the mystical properties of severed human hands?) The spell goes a little awry as it wakes up every body in the place. Bernie is only able to give some rather cryptic comments about his death before the Hand of Glory is extinguished. They leave, John revealing that the cost of this spell (all magic has a price) is some of his own lifespan which Zed is leery over – but she is the one who manages to make sense of Bernie’s cryptic mumbling. Interlude to the woman from the beginning who hides the demonic cold record in her extensive collection where it freezes the shelf and rather worries her daughter, Julilah. Back to Zed and John who go to see Marcus Moon in a nursing home who owned the abandoned studio and John pulls out an American accent and a magic card. Interviewing Marcus they learn of a musician who was rumoured to have sold his soul and how the acetate recorded the voice of the Deceiver when the musician, Willie Cole, was claimed by the demon during a recording (which left a huge mess). Unable to destroy the record, he buried it. And recently a private investigator came looking for the record, hired by someone called Fell. Marcus then dies after talking about seeing an angel, Zed runs for help – and time stands still for everyone but John. Manny appears. Well, at least he did see an angel. He touches Marcus’s forehead and his heart monitor stops. Later in the car, John tells Zed he recognises the name “Fell” and once knew an Ian Fell – he also explains why the devil wants souls (petulant revenge against god) while we see little Julia go grab the icy record from the shelf, listening to its whispers. John and Zed go to the Fell household (clearly the house we saw the woman and Julia in) and let themselves in. John meets Ian with a shouted insult, breaking glass and ramming him into a wall. He assumes Ian made a deal with the devil (since John considers Ian talentless but oddly successful. Oh John, you don’t need a devil for that, autotune can work wonders). He’s right – but Ian didn’t make the deal, his wife Jasmine did (the woman we saw earlier and the reason why psychic Zed keeps smelling Jasmine). She has a gun but John throws scorn at her for selling her soul for lots of money – but it turns out she actually did it to cure Ian of cancer. She shows them the contract she signed when a “soul broker” called Anton approached her in the hospital (apparently a habit of theirs) when Ian was diagnosed with incurable cancer. The contract is fading – when all the words disappear the “first of the Fallen” gets to claim their prize. But Anton contacted her and offered to break the contract in exchange for the record (which John considers very out of character). John goes to see Anton in his creepy, fire hazard surroundings and after intimidating the middleman the real broker appears – Papa Midnite. Just in case we missed the implication. John brings up voodoo. John gets knocked out mid-rant. He wakes up tied down while Papa Midnite expositions about why he wants the record and that he’s sent his minions out to collect it since John conveniently dropped Ian Fell’s name. Papa Midnite decides to slowly bleed John slowly to death while leaving the dubious cure out of reach if John can get to it because… no I’m not even going to try and explain his reasoning, it’s typical James Bond villain nonsense. Manny shows up to taunt John a little about what his actual intentions are for the record, but doesn’t cut John loose because Reasons. Midnite’s goons take the acetate and leave: Jasmine worries about John but Zed is confident he’s smarter than them and remembers half of the tracking spell John sneaked into Jasmine’s pocket. Which allows her to track him down and rescue him from the homeless guy who nearly kills him (John’s escape plan was rather lacking). Midnite’s goons have already fallen under the sway of the record just from touching it. They took it to a club and played the music – which leads to a line of bodies outside. Chas arrives with some supplies for John (and has checked up on Zed – her fingerprints don’t show up on any police database). He and Zed interview the busboy (who is deaf – but Zed knows ASL) who describes how people were affected by the record. John realises the men have left Midnite’s control and that they’re going to play the record to as many people as possible – and Zed has a vision showing which radio station. Zed takes charge and John has a rather obviously petulant moment of waiting so he isn’t seen to be following her orders but it’s rather gloriously lampshaded. They arrive and John goes in alone since he has an MP3 player he can listen to to block the demon music. While John works his way inside, outside Chas drives a car into something vital, taking the station off air. But inside John runs into a mob being affected by the music and one of them rips his headphones out. Demonised he falls to the floor – and it takes Papa Midnite with earplugs and a shotgun to take down the speakers. John refuses to let Midnite take the record and casts a spell blocking it and Midnite’s goons in a room before calling on its dark magic to send it back to Hell (and the goons with it – we infer by the very messy blood spatter). When Midnite finally gets into the room he sees a very very ominous looking chasm. There’s a hellmouth in Chicago now, good job John! John takes Anton back to the Fell residence and they can reverse the contract… but while Jasmine will get her soul back, it means Ian will lose his cancer remission. She objects but Ian points out they’ve had a 20 year reprieve, there’s a good chance that medical technology could now save him. This literally means forcing Anton to eat his contract. We end with Papa Midnite making a voodoo doll of John and bruning it (his “pact” contrasting with Zed’s prayer – check that good and evil symboluism. Especially since Manny tends to show up to taunt John a bit then disappear. I thought after last episode, John had tested Zed and she’d proved her worth. This may have been me being uncharacteristically optimistic and when this episode opened I was leery about the protectiveness coming out again. I’m actually much much happier with John being suspicious of Zed. Suspicious is ok. Suspicious is reasonable. Suspicious means he respects her as a threat and a hazard. Then this episode happened - and Zed repeatedly proved herself useful, essential even. She has excellent skills John can’t touch, her powers are very helpful (and save a lot of pesky investigating) and she outright saves his life. We even have a pouty John moment when she seems to take charge. This is an excellent reversal so can we take it as done now? No more episodes of John trying to “protect” Zed or leave her behind.